When one throws into Google the title of the latest film by iconoclastic French film legend Jean Luc-Godard, The Image Book, something interesting pops up. Besides various reviews attempting to batter around the ideas found within this opaque, captivating new work of collage, the film is found to be billed as a hybrid Documentary/Horror film. Floating around in the same cinematic netherworld as a film like Histoire(s) du Cinema or even his previous Goodbye To Language 3D, The Image Book feels perfectly summed up by these descriptors and yet beyond classification. This era of Godard’s work seems to be fueled by, if anything specifically, an intent on recontextualizing images and man’s relationship to them. 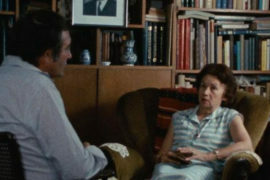 While for the vast majority of the film’s brisk 85-ish minute runtime is focused centrally on everything from consumerism to environmentalism through a lens that can only be described as an incredibly modern image sampling conceit, The Image Book breaks slightly from this mold to focus its most clear-eyed lens on the Arab world and its relationship to the West. Godard’s most decisively documentary-leaning segment, the film sees Godard stick to his interest in dichotomies and visual distortion, this time harnessing it for something truly specific and vital. Through what amounts to more or less the film’s final third, Godard cuts from things like surveillance footage of attacks by ISIS to scenes from films about and made within the Arab world, in an attempt to draw forth the idea that the Arab experience is one perverted by Western ideals and Western caricaturing. 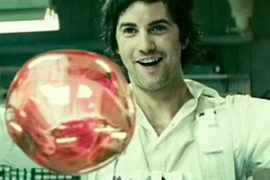 Throughout the film’s first half viewers are accosted by numerous images of war both literal and fictional, and of revolution. Footage of Holocaust graves is cut opposite something like a brilliant use of footage from Passolini’s Salo, reclaiming the film as an act of revolution instead of the perverse joke it’s become in cinephile circles, it is in this juxtaposition the film’s most exciting ideas are born. And yet, this film is decidedly not a documentary. 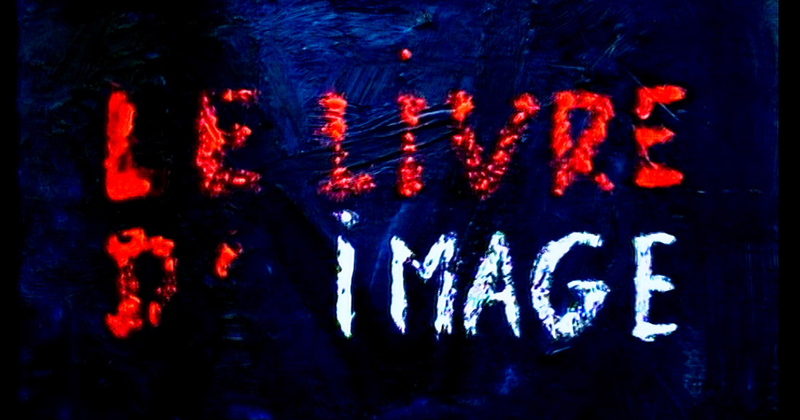 Again feeling closer in execution to collage work, Godard has not just done away entirely with any semblance of narrative but has gone into an almost primordial state with his use of image and sound. Instead of simply narrating the film, Godard layers sound upon sound upon sound to create an atmosphere that feels rightly described as horror, with the images matching. And the distortion doesn’t stop there. Arguably the film’s most thrilling aspect is the experimentation one sees in the use of images by Godard and collaborator Fabrice Aragno. This isn’t anything new for the director, particularly in this “late” period of his career. However, one should throw that descriptor into quotations as this feels at once like a continuation of Godard’s interest in man’s relationship to images but also something of an evolutionary step. Be it a processing of an image as to turn it into something more resembling a static screen on an old rabbit ear television, or the filming of something off a television as to ultimately include the station identifier in the lower half of the image, The Image Book feels at once assaultive in its blending of sound and image, and yet something of a revolutionary moment for Godard. Even down to what may be his first discussion of environmentalism, this feels like a new step forward for a director on the back nine of his life. But to try and cleanly sum up this film, as with much of the work of Godard, is total folly, especially on the first or second viewing. 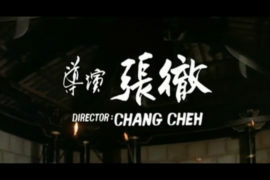 Closing on a series of title cards denoting the sources from which the director draws his narration, music and footage, the film is chock a block with ideas, images, sounds and tones all bouncing off one another to create a film that’s as much about revolution as it is Godard’s call for one. 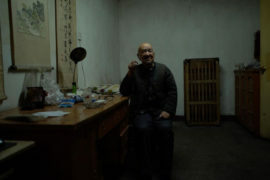 As dense a film could possibly be at such a brisk runtime, The Image Book defies classification and broad description. Violent, in so many ways, with regards to the speed at which information hits the viewer, this is an abrasive work that invites closer reading as much as it feels foolish to even try. And it’s not just a put-on sense of violence. Again a film focused squarely on war and revolution, Godard doesn’t simply fill The Image Book with furious narration on orientalism and war, instead using every frame as some sort of violent act. Be it his use of color distortion within the footage he uses, the abrasive sound or the assaultive way he edits the film together, this is as aggressive a work as we’ve seen from Godard in quite some time. In that way, it’s not quite like anything else the directors ever made. It’s a film that’s at once a capstone for a groundbreaking career, and yet, come the final frames (which are so brilliantly saturated that it may be one of the most breathtaking sequences the director’s ever shot) the breaking of new ground for a director who appears to just be getting started some six decades on. I’d be a dunce if I told you I fully understood what Godard was getting at upon the first watch. A director of context-free information dumps, this is an excitingly dense film that has the structure of an essay picture, the tone of a dystopian thriller and the scope of a history book. Free association on mescaline. A masterpiece.